Print this later — before you come. Welcome to Mobile Health 2012! Thank you for attending Mobile Health 2012. We are pleased to have you join us! Breakfast, lunch, and two breaks will be provided each day. Breakfast starts at 8 AM at the Frances C. Arrillage Alumni Center (Ford Gardens). There is also a beer and wine reception with hors d’oeuvres on Wednesday evening directly after the closing program for the day. Plan to stay and join in. There will be wireless internet access. The code will be available at the check-in desk. At times this access fails. If you have any special needs regarding diet, parking, accessibility, etc. please contact Tanna Drapkin immediately (tannad@stanford.edu). Mobile Health 2012 will be held at the Frances C. Arrillaga Alumni Center on the Stanford University campus. The Alumni Center is centrally located on the campus just past the stadium. 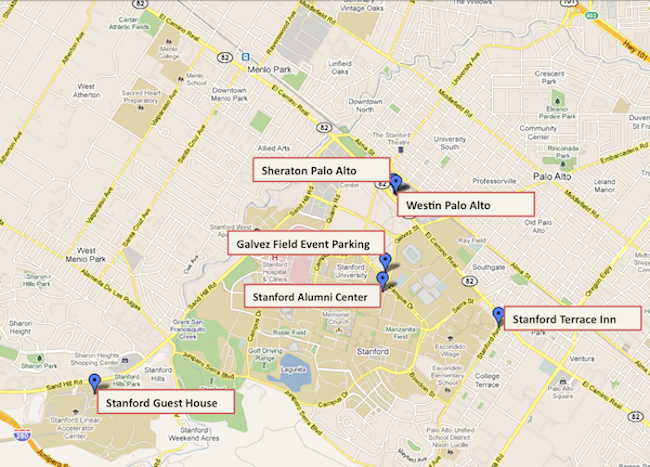 Click here for detailed driving directions to Stanford from various locations/main highways. From the conference hotels (Westin, Sheraton), it’ probably a 10 minute walk to our venue. It’s mostly campus, flat, and really sort of pleasant. 1. Coming out of the Sheraton/Westin, turn left on El Camino. 2. Walk to Embarcadero Rd. 3. Cross El Camino and head towards Stanford. El Camino becomes Galvez Street. 4. You’ll pass the stadium on your left. 5. Stay on Galvez until you reach Campus Drive. 6. Cross over Campus Drive and walk approximately one block (on Galvez) to the Alumni Center entrance. Stanford offers a free shuttle called the Marguerite that runs from the intersection of Galvez St. and El Camino Real at the Town & Country Village shopping center. This is a very short walk from the hotels. You take Line Y to catch a ride towards the Alumni Center. Line Y runs from 6:09 AM to 8:30 PM every 15 minutes. View the schedule here. Here is a map of the Marguerite’s routes. From the Alumni Center back to the Sheraton and Westin, you’ll need to take Line X back to El Camino Real and Galvez. The schedule is here. Turn left on El Camino Real coming out of the hotel. Take a right at Embarcadero/Galvez St. into Stanford campus. Pass Arboretum and take your first right after the stadium onto Campus Drive West. For free parking, turn right and into Galvez Field. The front desk staff at the Sheraton and Westin can easily arrange a cab for you. It’s about a five minute ride to the Alumni Center. The SLAC line of Stanford’s free shuttle, the Marguerite, operates between the Guest House and the Stanford campus and is available from 7:30 AM to 8:00 PM, approximately every 20 minutes. Get off at the final stop and walk down Galvez St. The Alumni Center will be about a block and a half down on your left. The Guest House also has their own complimentary Guest House shuttle which may be available to transport you throughout Stanford based upon availability. Ask to go to the Alumni Center. Take a right out of the parking area on Sand Hill Road. Go 2.2 miles until you see Arboretum Rd. Take a right. Take next right on Palm Dr. Take next left on Campus Drive. Look for Galvez Field free parking on left. The front desk staff at the Stanford Guest House can easily arrange a cab for you. There’s a big open space we’re renting by the Alumni Center called Galvez Field. Directional signs will be on the main streets that go by Galvez Field. This parking area is about one block from the Alumni Center. 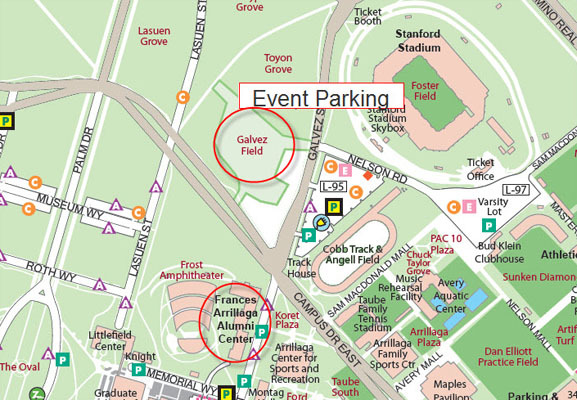 If you have any special considerations in terms of parking, please let Tanna Drapkin know immediately so she may help you coordinate (tannad@stanford.edu). Dress is business casual (emphasis on casual) for most attendees but be prepared to see a range. Our advice is that no matter how you dress, dress for the weather. You can’t go wrong with “layering” even in May. In 2010 it was cold and rainy at the end of May. Last year we had record high temperatures at the beginning of May.